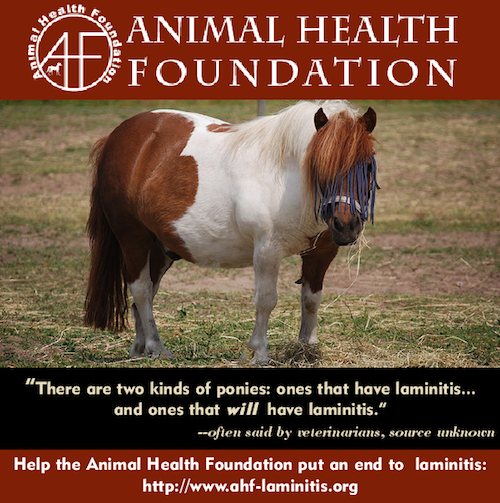 Animal Health Foundation: Laminitis Research : Laminitis Soundbite: Why do veterinarians say there are two kinds of ponies? Laminitis Soundbite: Why do veterinarians say there are two kinds of ponies? The Animal Health Foundation has been working quietly but steadily for the past 30 years to fund research around the world that will put an end to laminitis. Some of this research has required looking more closely at the way horses' feet function. Other projects looked at the roles of enzymes, gut flora, hormones and grass types. We've funded research into causes, treatments, pathways and prevention. Researchers in the United States, Australia and Europe have collaborated under the AHF banner. In fact, laminitis research is all we fund. When we're done--and not until then--there will be three types of ponies that veterinarians can include in their quips. The third type will be the one that never has had laminitis, and never will, because of the dedicated support of people like you--people who want to see an end to the suffering and pain of laminitis in horses. If anyone tells you that laminitis is all figured out, that they have the answers, or that your horse isn't in danger, don't believe it. We are close to understanding the disease, which has many forms, but we are not there yet. With your help, we might accomplish our goal, and your horse will be able to live its life without the fear of this disease. Until we have all the answers, no horse is truly safe. Things might not be as grim as the old veterinarians' joke, but there is still much we don't know or understand. Please support the work of the Animal Health Foundation. We donate 100 percent of donations directly to research. We want the same answers you do, for your horses and ours.